FJ Bumper Wings on the Toyota FJ Cruiser are one of the few design flaws of an otherwise very capable off road vehicle. They are plastic. They stick out. They break off. We can replace your front bumper wings with powder coated aluminum diamond plate panels that bolt in to the bumper and fit right in the slot that remains when you remove the old wings. Some people call them replacements, some people call them eliminators. Whatever you call them, the diamond plate panels look good, are more durable than the OEM FJ bumper wings, they are flush mounted to the bumper, so they do not stick out, and can be powder coated any color. 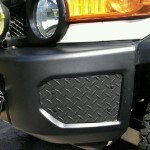 They are an inexpensive alternative to a new off road bumper, easily installed, easily removed. And they are a great transitional mod that will hold you over until you decide which off road bumper you want to install. 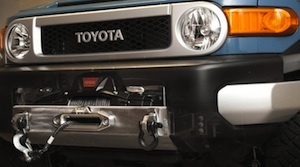 Making the OEM FJ Bumper Wings more practical for off-roaders since 2007.